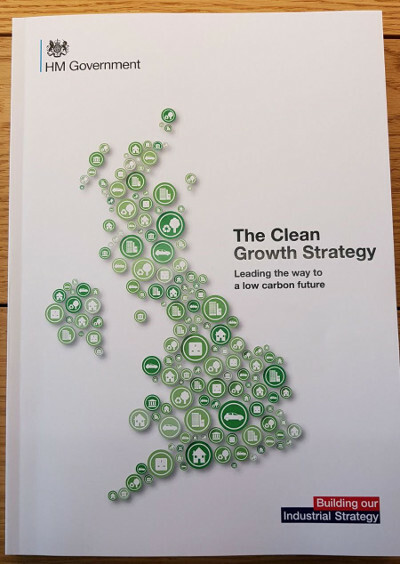 The Clean Growth Strategy, long overdue, is finally here. There are some positive steps forwards. Home insulation had all but ground to a halt with the removal of schemes to support it - the promise of £3.6 billion investment to upgrade around a million homes is welcome. Another £1 billion is promised for electric cars and £1.2 for cycling and walking. £900 million is promised for research and development, with £460 million of this going to nuclear, £265 million on electricity storage and grid technologies and £177 million to renewable technologies. The Hinkley Point cost fiasco has clearly not blunted appetites for nuclear energy. Offshore wind is given a boost, with plans for up to 10GW of offshore wind to be built in the 2020s. Yet onshore wind still appears to be off the menu (except in Scottish islands). It is extraordinary that the cheapest form of renewable energy is still blocked from competing on a level playing field, despite being relatively popular with the public. There are also no clear measures to boost solar, another cheap renewable technology, despite deployment having plummetted after government cuts. The Solar Trade Association expressed disappointment that the tax and regulatory framework was still not giving them a level playing field. Among the omissions, it is noticeable that there is no mention of fracking - is the government cooling off its enthusiasm for shale gas? There are many more policies trailed in the strategy, some detailed, some less clear at this stage. But perhaps the most important thing to note about the strategy is that it is not expected to be sufficient to reduce our emissions enough to stay within the UK's carbon budgets from 2023. As the table below shows, the gap widens further from 2028 onwards. This failure would make it much harder to achieve longer term targets from the 2030s onwards. Environmental lawyers ClientEarth have announced that they are 'considering legal options' around these missed targets. The report itself argues that there is no legal issue and that over-achievement could be carried forward from previous budgets, international carbon credits could be purchased, or even that future budgets could be made even more challenging to compensate for under-achievement. "We note that the Clean Growth Strategy suggests that ‘flexibilities’ in the Climate Change Act could be used to meet the carbon budgets in place of domestic action. This should not be the plan. The clear intention of the UK’s fourth and fifth carbon budgets is that they are delivered through domestic action to keep the UK on the lowest cost path to the 2050 target to reduce emissions by at least 80% compared to 1990 levels. That should be the goal, without the use of accounting flexibilities or reliance on international carbon credits."